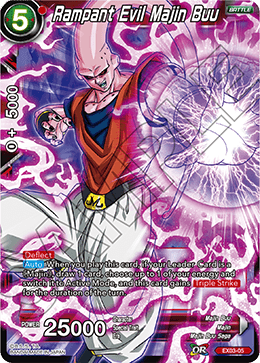 When this card attacks a Leader Card, you may choose 1 《Universe 6》 in your hand and place it in your Drop Area. If you do so, draw 2 cards. 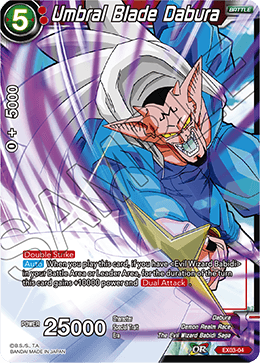 Choose 1 《Universe 6》 in your hand and place it in your Drop Area : Choose this card or one of your 《Universe 6》 Battle Cards. It gains +5000 power and for the duration of the turn. 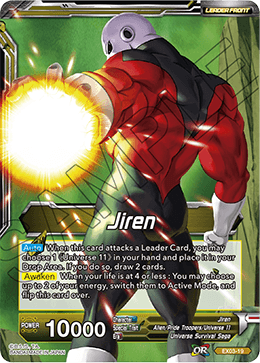 If your Leader Card is red, this card can attack Battle Cards that are in Active Mode. 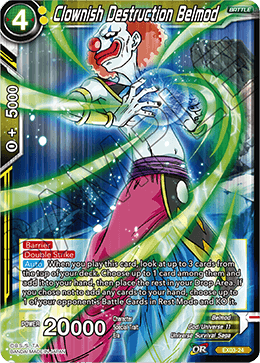 During your turn, when this card KO-s an opponent's Battle Card, inflict 1 damage to your opponent. 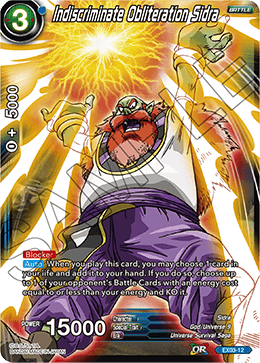 When you play this card, if you have ＜Evil Wizard Babidi＞ in your Battle Area or Leader Area, for the duration of the turn this card gains +10000 power and . 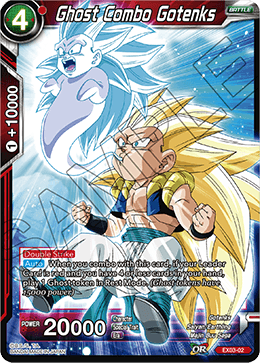 When you play this card, if your Leader Ｃard is a 《Majin》, draw 1 card, choose up to 1 of your energy and switch it to Active Mode, and this card gains for the duration of the turn. 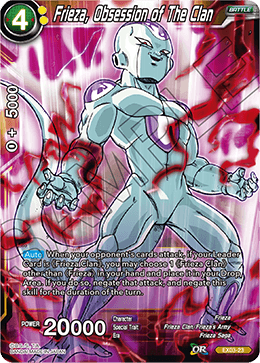 When you play this card, if your Leader Card is a 《God》 or 《Universe 6》, choose up to 2 of your opponent's Battle Cards with 9000 power or less and KO them. 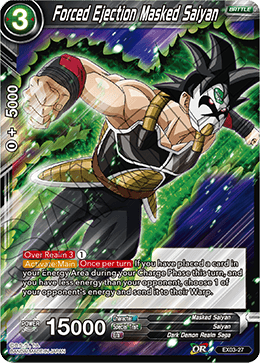 When this card attacks a Leader Card, if you have a 《Universe 7》 in your Energy Area, draw 1 card, and this card gains +5000 power for the duration of the turn. 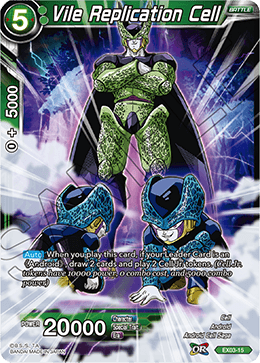 During your turn, if you have 3 or more 《Universe 7》 in your Energy Area, this card gains +5000 power. When this card attacks, draw 1 card. You may choose up to 1 of your energy and add it to your hand. If you chose to add a card from your Ｅnergy Area to your hand, choose up to 1 card in your hand and add it to your energy. 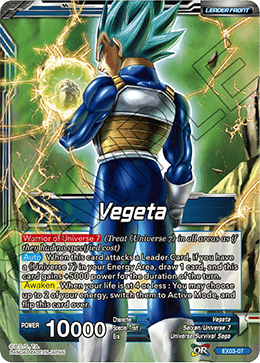 If your Leader Card is blue and this card is in Rest Mode, this card gains and your opponent's cards can't attack your Leader Card. 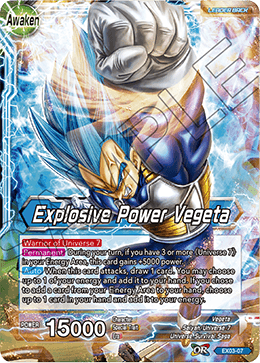 When you play this card, if you have 5 or more energy, draw 1 card. 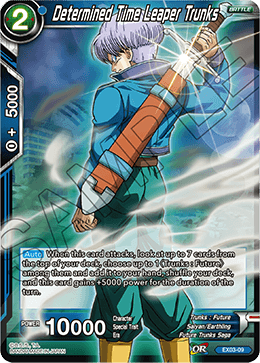 When this card attacks, look at up to 7 cards from the top of your deck, choose up to 1〈Trunks : Future〉 among them and add it to your hand, shuffle your deck, and this card gains +5000 power for the duration of the turn. 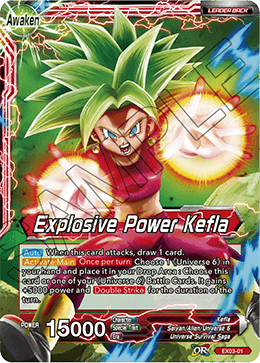 When you play this card, if your Leader Card is ＜Zamasu＞ or ＜Goku Black＞ and you have 5 or more energy, you may inflict 2 damage to your life. If you do so, choose up to 4 of your energy and switch them to Active Mode. When you play this card, you may choose 1 card in your life and add it to your hand. If you do so, choose up to 1 of your opponent's Battle Cards with an energy cost equal to or less than your energy and KO it. 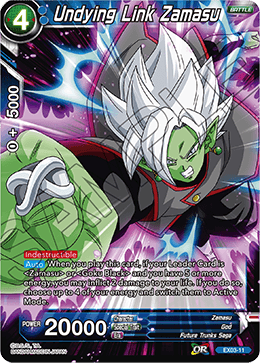 《Universe 7》(This skill takes effect when you have 1 or more of the specified Battle Cards in play) : When this card attacks a Leader Card, draw 1 card, and this card gains +5000 power for the duration of the turn. 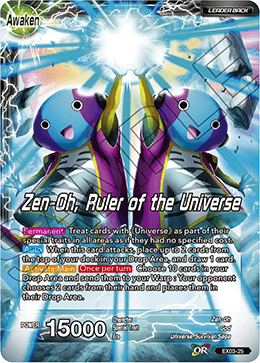 《Universe 7》 : During your turn, this card gains +5000 power and . Choose 1 of your opponent's Battle Cards and KO it. 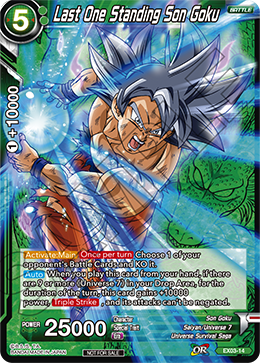 When you play this card from your hand, if there are 9 or more 《Universe 7》 in your Drop Area, for the duration of the turn, this card gains +10000 power, , and its attacks can't be negated. 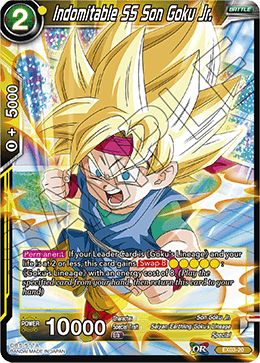 When evolving this card into a 〈Broly〉 with a different card name from your hand, the cost is decreased by . 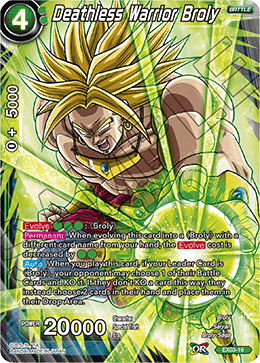 When you play this card, if your Leader Card is ＜Broly＞, your opponent may choose 1 of their Battle Cards and KO it. If they don't KO a card this way, they instead choose 2 cards in their hand and place them in their Drop Area. 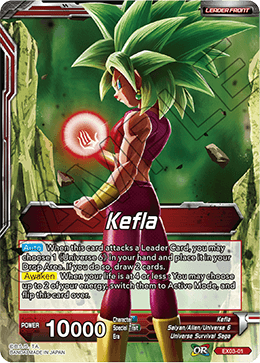 When you play this card, if your Leader Card is green, choose up to 1 of your opponent's Battle Cards and KO it. 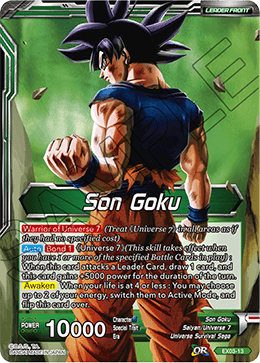 When you combo with this card, if your Leader Card is a 《God》 or 《Universe 2》 and youｒ life is at 4 or less, you may place 1 card from your hand in your Drop Area. If you do so, draw 2 cards, and this card gains +10000 combo power for the duration of the turn. 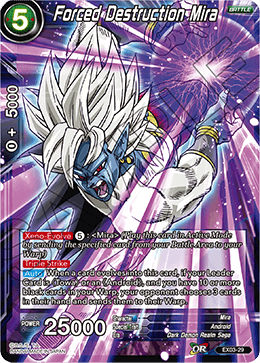 When this card attacks a Leader Card, you may choose 1 《Universe 11》 in your hand and place it in your Drop Area. If you do so, draw 2 cards. 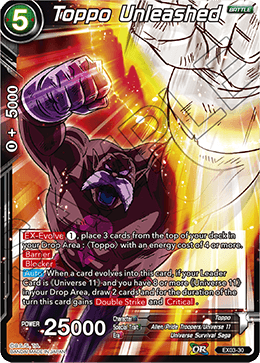 Choose 9 《Universe 11》 in your Drop Area and send them to your Warp : This card gains for the duration of the turn. 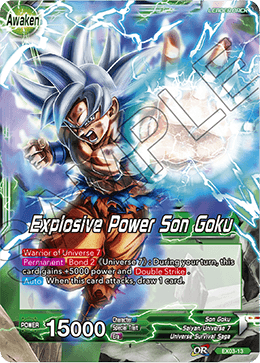 Indomitable SS Son Goku Jr. 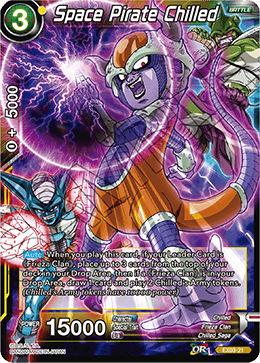 If there are 3 or more 《Frieza Clan》 in your Drop Area, reduce the energy cost of this card in your hand by 1. 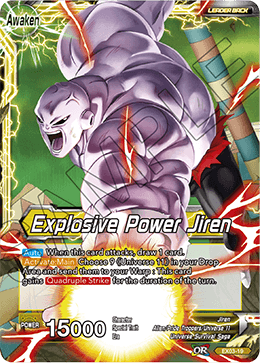 When this card attacks, if your Leader Card is 《Frieza Clan》, place the top 3 cards of your deck in your Drop Area, then if a 《Frieza Clan》 is in your Drop Area, switch this card to Active Mode. 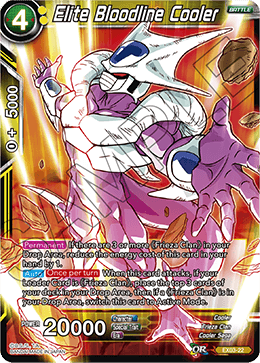 When your opponent's cards attack, if your Leader Card is 《Frieza Clan》, you may choose 1 《Frieza Clan》 other than ＜Frieza＞ in your hand and place it in your Drop Area. 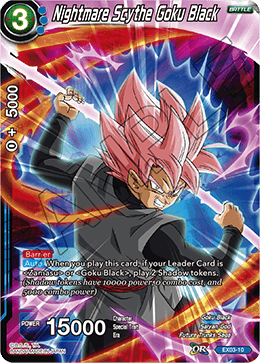 If you do so, negate that attack, and negate this skill for the duration of the turn. 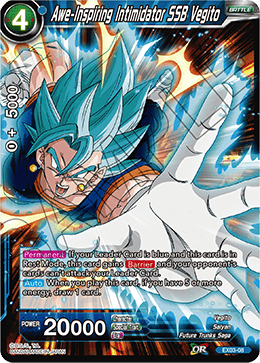 When you play this card, look at up to 3 cards from the top of your deck. Choose up to 1 card among them and add it to your hand, then place the rest in your Drop Area. 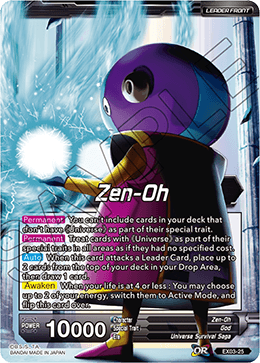 If you chose not to add any cards to your hand, choose up to 1 of your opponent's Battle Cards in Rest Mode and KO it. You can't include cards in your deck that don't have 《Universe》 as part of their special trait. Treat cards with 《Universe》 as part of their special traits in all areas as if they had no specified cost. 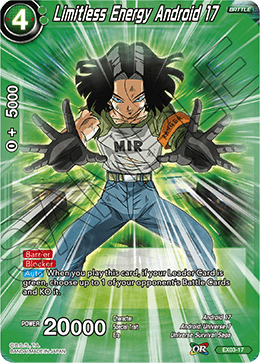 When this card attacks a Leader Card, place up to 2 cards from the top of your deck in your Drop Area, then draw 1 card. 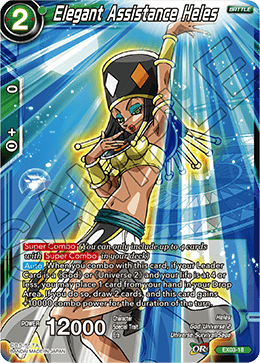 When this card attacks, place up to 2 cards from the top of your deck in your Drop Area, and draw 1 card. Choose 10 cards in your Drop Area and send them to your Warp : Your opponent chooses 2 cards from their hand and places them in their Drop Area. 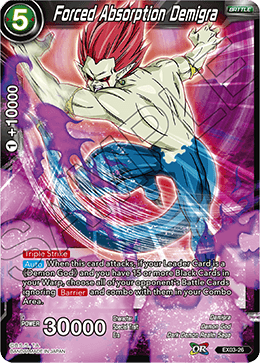 When this card attacks, if your Leader Card is a ≪Demon God≫ and you have 15 or more Black Cards in your Warp, choose all of your opponent's Battle Cards ignoring and combo with them in your Combo Area. If you have placed a card in your Energy Area during your Charge Phase this turn, and you have less energy than your opponent, choose 1 of your opponent's energy and send it to their Warp. 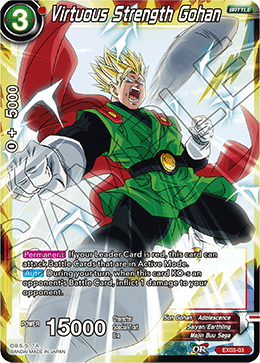 When a card evolves into this card, if your Leader Card is an 《Android》, your opponent chooses 1 card in their hand, places it in their Drop Area, then you choose up to 1 of your opponent's Battle Cards with an energy cost of 3 or less and gain control of it. 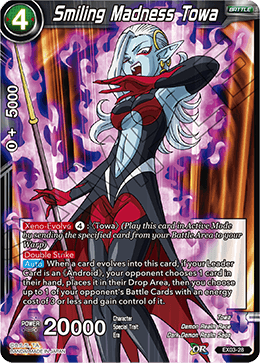 When a card evolves into this card, if your Leader Card is ＜Towa＞ or an 《Android》, and you have 10 or more black cards in your Warp, your opponent chooses 3 cards in their hand and sends them to their Warp. 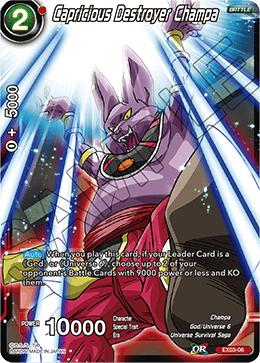 , place 3 cards from the top of your deck in your Drop Area : ＜Toppo＞ with an energy cost of 4 or more. 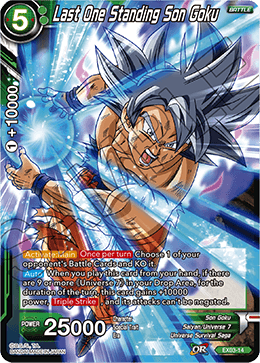 When a card evolves into this card, if your Leader Card is 《Universe 11》 and you have 8 or more 《Universe 11》 in your Drop Area, draw 2 cards and for the duration of the turn this card gains and .